The best senior fitness program for pilates exercises, seated workout and recovery from injury options for the elderly. The best workout for seniors! Training YOU For Life is at the leading edge of senior fitness and well-being, and is dedicated to keeping the mature and older generation fit and agile for life. These programmes offer a variety of safe, therapeutic, effective and fun workouts suitable for all abilities. Exercise is a very important component of living a healthier and longer life. Those exercising can stay seated in front of their TV and exercise their body and mind very effectively in a fun way. 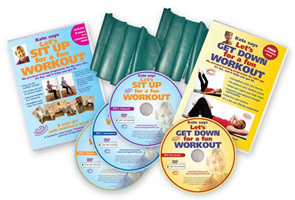 This package includes 3 DVD's (levels 1,2 and 3 of chair-based exercises) plus a free resistance band, and a floor-based DVD with a resistance band for you to keep in shape.